It’s a new year! New singers are welcome, especially those with children who will be well cared for, during this rehearsal time. Plus all our great singers who have sung before are needed to help us all learn how to be a choir together. Beth is directing; Ted Gentry is accompanying. There’s always great joy in singing together! (Practice Wednesdays, 5:45-6:15 PM). The Cherub Choir, for children ages 3 to 1st grade, rehearses on Wednesdays from 5:45pm-6:15pm. Following choir, the children are guided to Fellowship Hall for their own special dinner and then go to free play while parents are able to take classes during the 6:30-7:30 hour. This is our choir for children beginning as early as grade 3 and going through grade 7. Come learn from Beth! This choir meets Wednesday evenings at 5:45 in the Choir Room after worship. Are you a talented musician? Would you enjoy using your gift(s) during worship? If you are an experienced musician and are interested in playing as a part of the worship service please contact Beth Wilson to see what opportunities might be available. Several years ago Norman Chrisman presented me with four folders of documents related to the purchase and installation of the Rieger organ. After perusing the papers I had a full blown headache. “Why the headache?” you might ask. It came about when I realized the immense challenges and complexities involved in getting the organ shipped from Austria and the different components of assembling it in the sanctuary. One challenge before the organ arrived was the organ case. 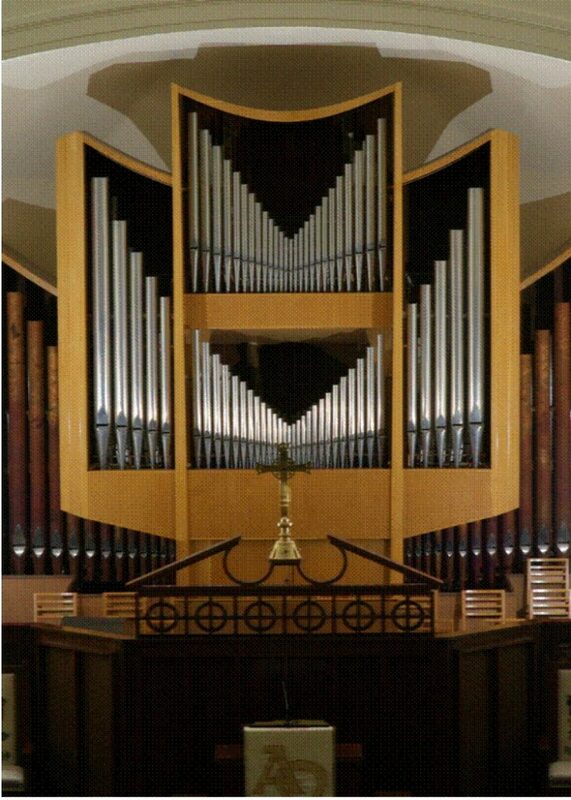 Because it was being built in Louisville and not by the organ builder, specific dimensions had to be met in order for the pipes to fit in the case. A second challenge was the chancel area which had to be totally rebuilt to house the new organ. Long-time member Norman Chrisman was the architect for the project and oversaw all the details through its completion. It was a monumental task in a time before emails, cell phones, FAX machines or the computer. A more recent perusal of the organ documents led me to some interesting information about the organ pipes. For example, of the twenty-two stops (1) nineteen are made out of various metals such as brass, copper and tin. Only two stops are made of wood. They are the Holzgedeckt on the upper manual and the Subbass in the Pedal. Here is the current stop list for the Rieger. There will be more information about the organ in the next Maxwell in Motion. (1) Specific sounds are produced by a stop, e.g. a Rohrflöte is a flute stop (notice the last part of the stop’s name and you can see why it considered a flute stop). Each stop has a draw knob and when the draw knob is pulled a specific sound is produced. There are five draw knobs which do not produce sound but rather serve as special devices. Two of those five are called Tremulant. These provide a vibrato type movement to the sound of a note or notes. The remaining three help couple the sounds from one keyboard to another. For instance, the top keyboard can be coupled to the bottom keyboard, to the pedal or both. The bottom manual can be coupled only to the pedal. (2) The number beside the stop name indicates the height of the lowest sounding pipe for that particular stop. (3) Fractions are associated with stops that produce more than one sound. For example, when playing middle C with the Sesquialter II on the Hauptwerk you hear two notes: the note you are playing and a note twenty-eight steps higher. The Mixtur on the Hauptwerk actually has five different pipes sounding at the same time when only one key is depressed. Four pipes sound when the Scharff draw knob is pulled from the Oberwerk division and three pipes sound when one note is played by the Rauschpfeiffe in the pedal division. (4) There are five reed stops on the organ. They include the Rohrschalmei and the Trompete in the Hauptwerk division, the Krummhorn in the Oberwerk division, and the Trompete and the Schalmei in the Pedal division. Reed stops are what would be classified in modern day terms as brass or woodwind instruments. The two Trompete stops are easily associated with their contemporary counterparts. The Krummhorn is the ancestor of the modern day oboe or clarinet. The Rohrshalmei is a cross between a Krumhorn and a regal, the latter being a keyboard instrument from the Renaissance period which had a woodwind/reed type quality sound.